Yanko Design: "We all love fruit but they’re not exactly cheap and usually demand to be eaten sooner than later, otherwise the ravages of time wreak havoc on them. 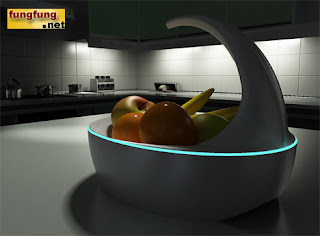 Blue is a concept fruit bowl that utilizes Action Fresh Blue technology - the same one found in the Halo vacuum and many new refrigerators. The blue wavelength inhibits and kills bacteria thereby prolonging shelf life. The fruits retain their nutritional value and you get a cool looking dockable, rechargeable bowl to boot. If that still doesn’t convince you, how about the thought of a cool blue glowing ring of light? I mean just that alone is enough to make me wanna go out and get one. 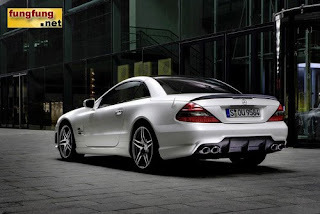 Designer: Ahmet Bektes, Koray Gelmez & Eda Kose"
FF: "Wow, Blue light makes me high~"
Autoblog: "Luxury German auto-maker, Mercedes-Benz, teamed up with Swiss watchmaker, IWC, to make a very limited and exclusive SL63 AMG. The car has a new white paint finish dubbed designo magno Kashmir, which is a combination of shades of pearl and egg shell color. The car has many special features and additions such as AMG sport seats that are covered with Tobago Brown nappa leather, black logo-emblazoned floor mats, and of course everything else the standard SL63 AMG has to offer. Only 200 cars will be made and the lucky owners of these cars will also receive IWC's "Grosser Ingenieur" watch." Hypebeast: "For those continually subjected to the elements, Porter has developed a new capsule of products called the Gear collection. 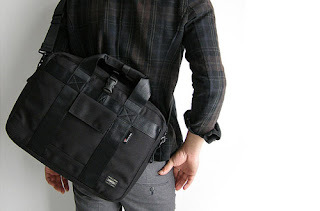 The Gear collection consists of a special Gore fabric made exclusively for bags which ensure ample protection against the wet for your equipment including laptops and cameras. To further compliment the Gore waterproof material, sealed zippers are also inclusive in the overall package."